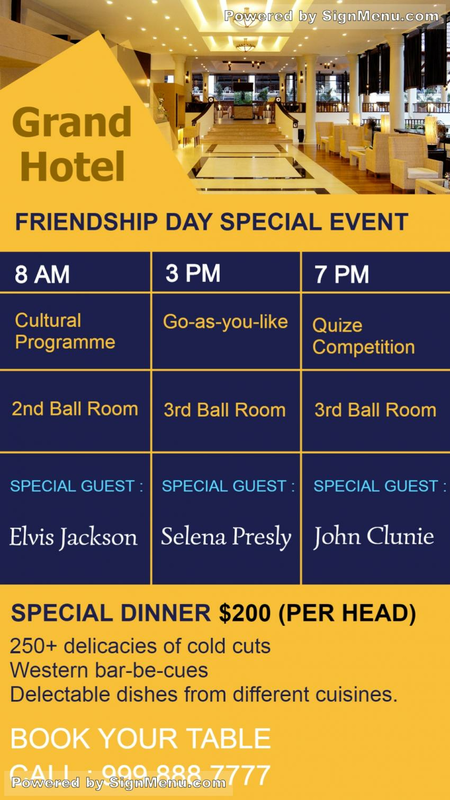 This template showcases the Friendship Day event occasions of a premium hotel ( with guest speakers ) which will draw-in the target audience . When placed on a digital screen atop the hotel premises it will have a scintillating impact on the target audience of these events, and the hotel can expect many visitors who will come in and spend on snacks & beverages. It is sure to attract the motorists who could also make an unplanned stopover. Good for the customer & good for the hotel. This template is ready for download and use.